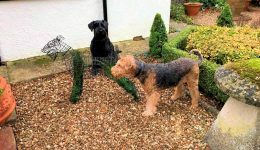 Lynda Hinton combines her love of her Airedale terrier with a new topiary challenge. 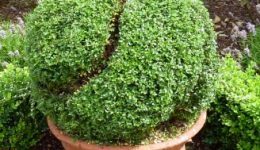 Chris Poole clips the new Ilex Crenata hedge that he plant back at the end of December and reflects on the differences with box. 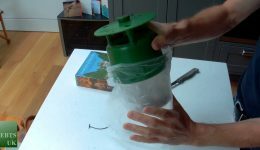 With the increase in problems caused by Box Moths & their caterpillars here is some hopefully helpful information on how to setup a pheromone trap. 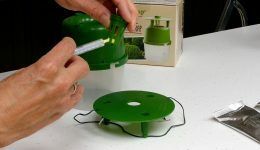 The traps catch the adult male moths and give a visible indication of that they are in and around your garden. Anyone who attended Art in Action 2011 could not fail to be inspired by the wealth of creativity exhibited at the event. I was privileged to be in the Sculpture section representing the EBTS and duties involved attending lectures and demonstrations given by two of our professional members, Jake Hobson of Niwaki and James Crebbin-Bailey of Topiary Arts.